What if we could make non-traditional publishing a less solitary, less exhausting, less perilous walk down the dark alley of DIY? Today I have something new for your consideration. Ethernauts can be among the very first to look over The Rogue Reader — a new development in “outsider suspense fiction.” It’s in soft-launch today, not yet at full power. The Champagne doesn’t hit the bow until early October, when The Rogue Reader is formally launched at the Bouchercon Mystery Convention in Cleveland. Before you click over to TheRogueReader.com, I hope you’ll read through this introduction. It should be worth your time to get a fix on what’s being attempted and why I think it’s worth your serious attention. You’re familiar, I’m sure, with Jason Allen Ashlock, literary agent and president of Movable Type Management (MT Management) in New York. Ashlock shares MTM leadership with his fellow agent, Adam Chromy, chief of the agency’s media operations. The merger of what was Ashlock’s Movable Type agency and Chromy’s Artists and Artisans made Chromy president of Movable Type Media (MT Media). Ashlock and Chromy are sure to be watched particularly closely by their peers in the hard-pressed community of literary agents on this new initiative they’re opening. Authors at our moment in publishing have two choices. They either give away their rights and their royalties to a large multinational conglomerate, in exchange for editorial, design, marketing, publicity, all basically theoretical. Or you go it entirely alone with a big tech company like Amazon or B&N or many others — in which case you get none of that support, none of that support, curation, design, marketing and publicity, but you get to keep your rights and your royalties. What we’re proposing is that that those are two really bad options for most authors. As we’ve come to call authors “hybrids” when they publish both traditionally and independently, Ashlock and Chromy’s Rogue Reader approach may be seen as a hybrid venue, a base of operation from which authors can move their work. What we’re saying at The Rogue Reader is that this is your third option. You get the benefit and flexibility and independence of self-publishing, in that you keep your rights and way more of your royalties. But you also get all the virtues of traditional publishing — quality editorial, quality design, the sense of being curated and chosen, capital-infused marketing and publicity — all as part of a community. Let me bullet out for you some points quickly. Six authors have been chosen to participate. The launch in the first week of October will focus on two authors, each of which in turn will be The Rogue Reader’s author of the month. First up as October’s author of focus at The Rogue Reader is the French-born, Tremé-based (New Orleans) writer Ro Cuzon. Cuzon will be represented by two titles coming out under the Rogue Reader aegis — Under the Dixie Moon, set in New Orleans, and Under the Carib Sun, set on St. Barts. Following Cuzon as “rogue of the month” in November will be Cleveland-based author Michael Hogan, who has previously published with Macmillan’s Thomas Dunne and Random House. Hogan’s two upcoming titles with The Rogue Reader are Dog Hills and Sistine. Our goal is not to scale this program. We don’t want to do 20 authors a month or 150 authors a year. In a noisy, cluttered marketplace, really good selection and putting money behind those authors we’ve selected is the way to do this. His and Chromy’s program, in fact, is designed to welcome readers who’d like to drill down for more information on its authors and their work. one piece of “immersive content” each week. That immersive content, Ashlock says, can be a long-form article in the genre, an author interview, a review, an essay, a video, something that informs and deepens a reader’s familiarity with the material and the authors. The simplicity and regularity of the plan is intentional. Ashlock refers often in conversation about The Rogue Reader to a “precision” he’s going for, in everything from initial curation to the building of a community and brand. And when Ashlock says “putting money behind those authors” and “capital-infused marketing,” he means that MTM, itself, is investing in the program, so there’s money behind the push for each author’s focus. For example, Under the Dixie Moon is a Barnes and Noble Nook Pick for October. There will be dedicated email blasts, exposure on the Nook homepage. B&N is interested in pulling people to its self-publishing platform. Authors then get 70 percent of net revenue — “net” being after MTM’s expenses. Another way to say it, Ashlock says, is that authors get some 50 percent of list price (and on Kobo, he says, something closer to 60 percent). The Rogue Reader’s books are all-digital, not print. The huge benefit there is that when you build on Pressbooks, the web and the book become one. You build once, then you spit out (editions in) EPUB, MOBI, PDF, and web content. Many traditionally published authors don’t have what we’re offering. That’s why we’re offering it. 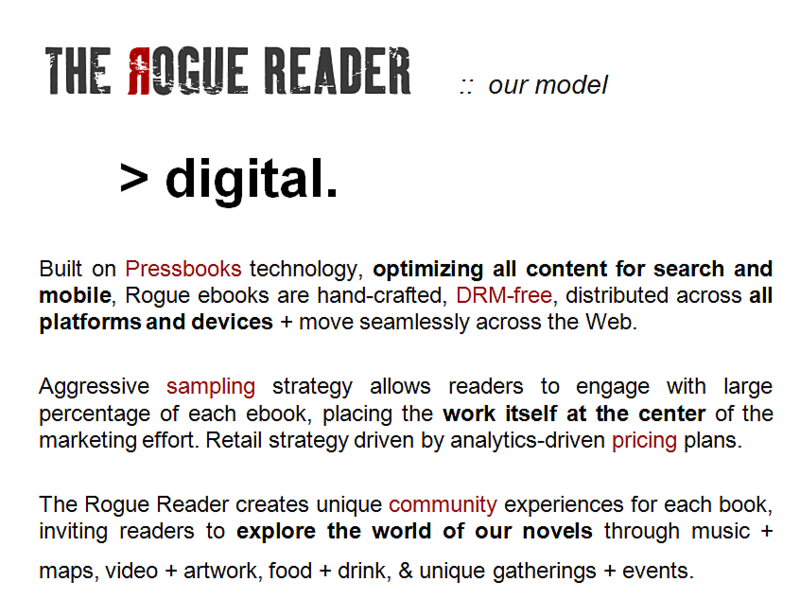 The Rogue Reader books will be priced dynamically, of course, based on analytics, but will start at $4.99 per book. This is aligned with the “abundance” mindset shared by many in digital publishing today and perhaps best defined in the work of Brian O’Leary. Put simply, the concept is that you attract more buyers by making your work abundantly available and affordable across as many platforms and formats as possible, thus holding down scarcity, the key prompt to piracy. And one of the cool things we’re doing is a transmedia rollout for each author. We produce cocktail recipes inspired by the book, playlists inspired by the book, Google Maps that chart the course of a book’s action, we do videos produced by documentary filmmakers with our authors talking about their influences, we have artwork we’re commissioning from Brooklyn artists. This, by the way, is not necessarily the interpretation of “transmedia” as an integral, developmental storytelling component of the kind focused on at the upcoming StoryWorld Conference in Hollywood in October. Instead, Ashlock is talking of surrounding each work with a “transmedia constellation” of elements running parallel to the book — always with a goal of giving the reader a point of access, a relationship with the work. We’re using all these things as a way for people who find the books and want to dive deeper into that world of the author. And for people who haven’t found the book, we want them to have a way in. Maybe it’s the jazz playlist for Under the Dixie Moon, set in New Orleans. As crowded as the marketplace is and as hard as it is to find books you want to read, I think people are even more prone to go back to the worlds that are familiar, and to the authors whose voices they trust. We default even in greater numbers than we did before there was so much choice. So what we want to do at The Rogue Reader is create a world, we want people to come to know the anti-hero, the wounded protagonist, which is at the core of Ro Cuzon’s novels. We want them to trust him and want to read more about him and come back for more books by him, get into that world and live there for a while. Then they’ll come back knowing they like that world. The Rogue Reader concept signals something for authors to watch. This is a collective of writers being pulled together by a management at the center — MTM is the “gravity” at the heart of the effort. By developing and showcasing their work in the context of this site and community, these writers get what an imprint should provide: branding followed by engaged readers. As such, The Rogue Reader ties into some great conversations I think we’re all going to be having as our new season of major publishing conferences kicks in — I’m looking forward to to exploring with you the kind of promise this “rogue” holds for digitally empowered authors in the deep-noir of its potential. All the values we’re talking about are in line with the word “rogue.” These authors are outsiders. They’re often rebellious in a way. It’s crime, suspense, thriller work done in really fresh ways — so close to the edge of their genre that it’s really why traditional publishing wouldn’t publish them. We think this is why people will love them. The formal launch event for The Rogue Reader is a party scheduled for the evening of October 5 during Bouchercon 2012 at Cleveland’s The Map Room. Ro Cuzon’s Under the Dixie Moon has an October 1 release date. His Under the Carib Sun releases October 16. Michael Hogan’s Dog Hills and Sistine are to release on November 5 and 19, respectively. 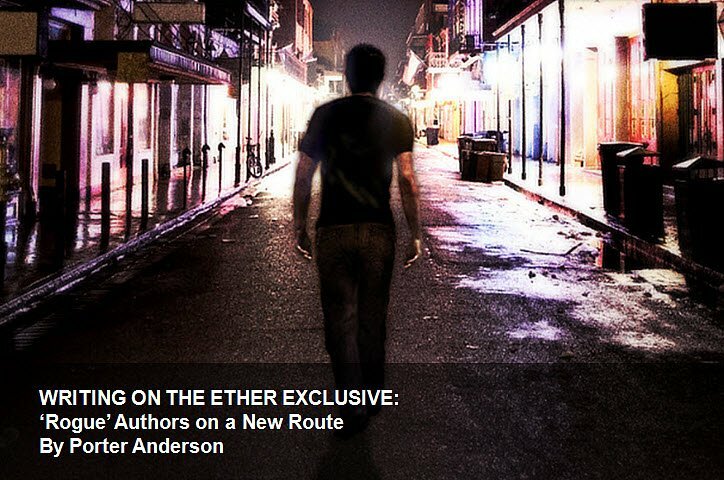 Click to read this week’s full Writing on the Ether col­umn at JaneFriedman.com. This looks like a great venture, I just hope it takes off and can pull in enough publicity. My dystopian rogue protagonist-led novel would have fitted well in there but it’s now serialising on a new genre fiction e-site called JukePop Serials (www.jukepopserials.com). They’re on their beta launch and I think one of the biggest issues for any of these idie sites is getting enough publicity to pull in enough traffic to make the system viable and lasting. Anything that widens the possibilities for authors and readers alike is worth a go. Wish them luck. ← EXTRA ETHER: Who Owns Your Tweets?